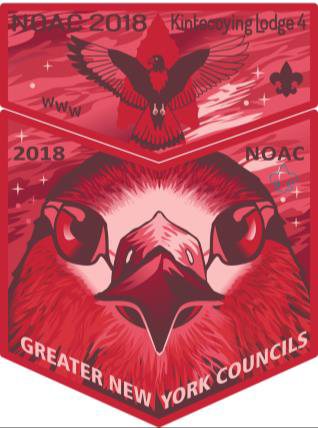 A year ago I was posting about a Section NE-3A 2002 Conclave Neckerchief sent in by Todd Rogers. I bought a collection last weekend and found an interesting piece in there. Apparently there was also a Neckerchief that participants could have made for that weekend. I’ve pictured it here but figured you’d want to know. 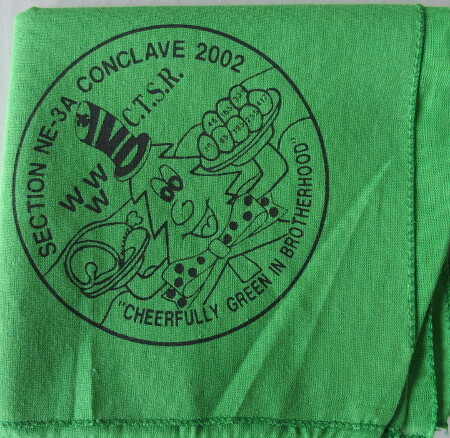 I previously added the image to the original post which shows the other items made for the Section NE-3A 2002 Conclave. 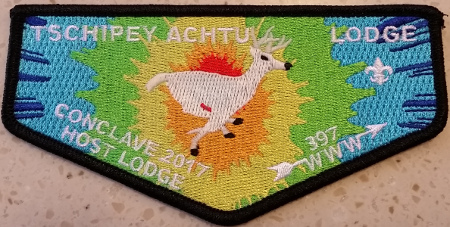 Tschipey Achtu Lodge #(95) was the host for the 2017 Section NE-3A Conclave. They issued a flap to commemorate their hosting. This was also the first time they have used a number on their flap, in this case their council number 397. 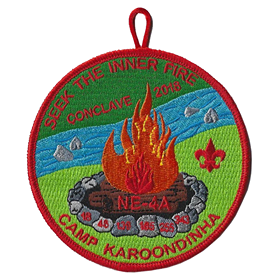 The 2017 Section NE-4A 2017 Conclave was hosted by Gyantwachia Lodge # 255 and held at their Camp Karoondinha,. The theme was “The Order of the Arrow’s Got Talent”. At first Todd Rogers had advised that there was only a single pocket patch. 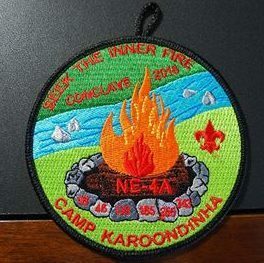 He than found out that at the end of the event, a staff issue is a red bordered version of the conclave patch was revealed. They had 98 people on staff and had 100 made. Anyone have on of the red bordered patches available? While Tschipey Achtu Lodge #(95) has had a Northeast Region Chief, they now have had their first National Chief, Forrest Gertin in 2017. They have issued 3 flap sharing a common design with different border colors. The Black border is pictured below. 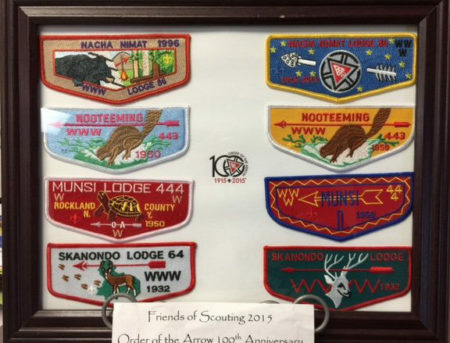 The Red was sold by the lodge, the white is the Chief’s Gift Flap and the Black is a Thank You version. Anyone have the White or Black Borders for sale or trade? 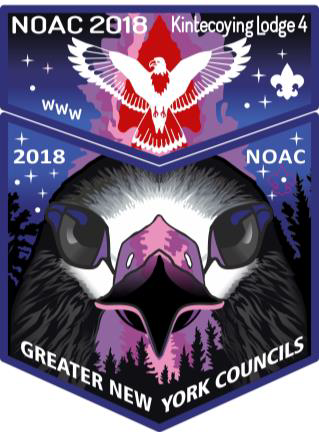 As part of the 2015 OA Centennial celebration, Nacha Nimat Lodge #86 issued a set of eight current and historical flaps as to celebrate the event. There were two flaps issued for Nacha Nimat and 2 for each of the predecessor lodges. The second flap for Nacha Nimat shares the design of the S85, but rather than a White 1915-2015 has the years shown in Red. The S52 Flap set can be found here. I understand their were 25 sets made, and no flaps were sold outside of the set. 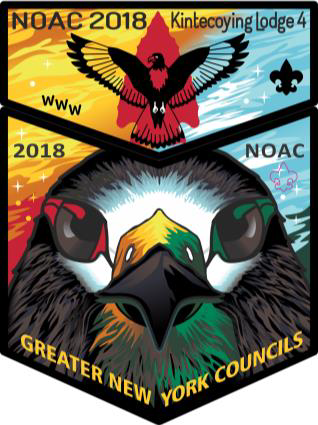 For the first time in its history Kintecoying Lodge is making all three versions (Fundraiser, Trader & Delegate) of its 2018 NOAC sets available to the general public. The fundraiser version is available separately. External sales have ended and items are being shipped. The trader and delegate sets are only available with the purchase of the full set. 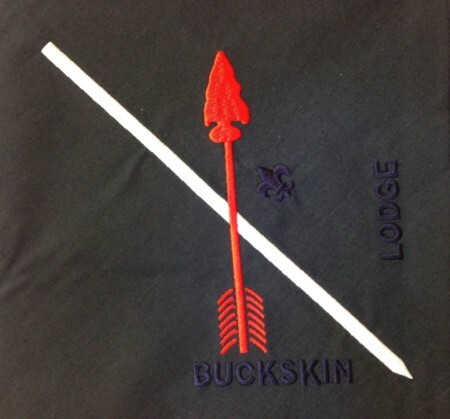 Two years ago I was posting about a then new neckerchief from Buckskin Lodge #412 submitted by Brian Petrowski. 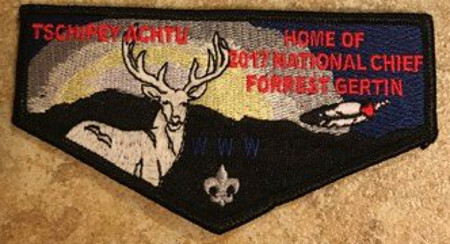 Here is the new Buckskin Lodge neckerchief Buckskin Lodge and the fleur di li are ghosted but you can see them in this image. The arrow and white line are embroidered. This is the neckerchief that new brothers that complete their Ordeal will receive in their kits. I’m looking for one of these if anyone has one for trade or sale?